DEBORAH CROMBIE: I am an instant fan of anyone who quotes the wonderful Irish poet Seamus Heaney. Add in Boston AND Ireland and you really have a treat. Most crime novels are driven by secrets of one sort or another, and I'd hazard a guess that the Irish have more than their fair share. I've become fascinated in the last few years with the Troubles, so am always keen to read anything that sheds light on turbulent Irish history. 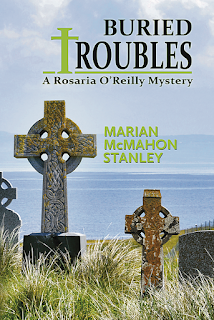 Here's author Marian Stanley to tell us how this ties into her latest Rosaria O'Reilly mystery. This is so intriguing! Psychologists tell us that keeping a secret can hold us in a developmental deep freeze. Life can be frozen at the point in which we learn of or even see something that can’t be shared – ever. The emotional strain and ethics of keeping long-held secrets drive much of the narrative in the second Rosaria O’Reilly mystery BURIED TROUBLES. Set in Boston and the stunning landscape of western Ireland, the story follows a search for answers after the body of young Irish journalism student is found floating in Boston Harbor. In BURIED TROUBLES, a man does penance his entire life in service of the secret he is keeping – not able to live authentically because he is always conscious of what he witnessed and can never talk about. This particular secret is special and unique to his home country, one wrapped in old grievances and crimes. Never far from his mind, it exerts a gravitational pull that he can’t escape. Add a layer of Irish history with all its turmoil, complications and oppression and you have the famous Irish adage, which followed the immigrant community to Boston’s Charlestown, Southie and elsewhere. “Whatever you say, say nothin’.” Don’t be a snitch. Don’t be a tout. Don’t tell. A code of honor which would be familiar in any inner city neighborhood today. “You know them by their eyes, and hold your tongue”, said the beloved Irish poet Seamus Heaney. Or, as the songwriter Colum Sands from County Down, put it – “Whatever you say, say nothin’ when you talk about you know what . . . For they’ll take you off to you know where for you wouldn’t know how long.” And who is the they? It could be the oppressor or it could be your own ones. There is a great freedom in the releasing of secrets, but releasing a secret is disruptive. There is always a price to be paid and life is never the same, both for those involved and for those who might go digging for answers. There are repercussions and sometimes great danger, as there is for Rosaria O’Reilly in this story. Danger from those who won’t let go of the past and its secrets, danger of a different sort in an old flame from her University of Galway days who threatens Rosaria’s relationship with Boston Police Detective Solly Belkin, and even an unexpected danger to her own family history. In this book, families move through life keeping old secrets from each other. Families have always done this. The secrets differ from family to family and don’t necessarily involve a crime, as we have in BURIED TROUBLES. Perhaps it’s an old affair, perhaps it’s sexual orientation, or maybe it’s an older sister who is really the mother of the youngest child. Perhaps something as sweet as when our longtime and well-loved Irish babysitter was somehow able to put an altered birth date on her citizenship papers so that she was eternally younger than her husband – at least in the US. What’s your viewpoint on or experience with secrets and their impact on lives? I’m happy to send a copy of Buried Troubles to a selected commentator. Marian McMahon Stanley is the author of two Rosaria O’Reilly mysteries from Barking Rain Press - The Immaculate (May 2016) and Buried Troubles (June 2018) as well as a recent short story “Career Transitions” in the Sherlock Holmes Mystery Magazine. 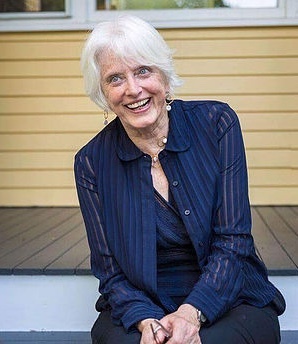 Marian enjoyed a long international corporate career and, most recently, a senior position at a large urban university. She writes in a small town outside Boston. DEBS: Be sure to comment for your chance to win a copy of BURIED TROUBLES! And I want to know more from Marian about her own connection with Ireland. Congratulations on your newest book, Marian. “Buried Troubles” sounds quite intriguing and I’m looking forward to meeting Rosaria. The revealing of long-held secrets always seems to bring heartache and grief; better, I would think, to be honest from the beginning. But I’ve no real experience with it as we’ve never been a family for keeping secrets . . . at least, as far as I know. I’m glad that your family is good about being open, Joan. Life is much easier that way! I hope we are all better about being open these days. Life can get complicated either way, of course, if we hold the secret or if we reveal it. All told, though, I think letting it out is wiser in the long run! Wait, so we have an author from "outside Boston" AND a mystery series set around all things Irish? How did I not know about this before? This sounds like a tailor-made series for me, since I am usually completely in love with Ireland or Irish based mysteries. Jay, you will LOVE Marian's books! Well, I hope you love this one, Jay! Fingers crossed...now to find the books and lay the cash down. I was lucky enough to read an early copy of this book. Marian knows how much I loved it! I agree, secrets can be very destructive. I try to live without them. Me too! Though, with other people's secrets, I try to be “as deep as a well” - as my grandmother would say! It’s a learned skill set to know some other people’s secrets and not blab! That's true. I'm keeping a friend's secret close to my heart right now, but that's as it should be. Welcome Marian and congratulations on the newest book. I look forward to reading it. Secrets? Every family has them, and what is interesting to me is that most of the members know the secret but think they are the only ones who do! Therefore the elephant is on permanent display in the living room. Wouldn't it be nice if someone pointed it out and cleared up that space once and for all? I LOVE this comment, Ann! Of course, you are right - many (most?) times the secret is not such a secret, though the family is pretending it is. And how healthy and refreshing would be to just get it out there! welcome Marian, so happy to have you back with your SECOND book--hurray! and what a lovely blog post. Did you find this one easier or harder than the first? Thanks, Roberta! BURIED was written during an unusual time here when we had a lot of life events to deal with - just the way it is sometimes! So, it was something of a triumph that BURIED happened at all. Of course, in those challenging periods, writing - if we can be ferocious about finding some time - is kind of a safe harbor. And you feel so good when it comes together. In any case, it’s hard to compare the processes for both books because of the circumstances, but I think if I hadn’t had the experience base of THE IMMACULATE, writing this book would have been much more difficult. Looking forward to finishing #3 book, which is is an incoherent mess right now - having found my way through that stage with two books, I have faith I can do so with a third! In general, I have to agree with Edith. Secrets (serious ones) are destructive. Living without them is probably the better bet for happiness. But they're great for fiction! Ah yes, Mary - agree on both counts! Keeping secrets uses so much energy - who needs it? And where would we be with our story-telling without deep, dark secrets to move the plot along? Sure sounds like my kind of book! I have always hoped to find an Irish ancestor but unless we go back several hundreds of years maybe longer, there is no one. So I read everything I can and imagine all of the characters to be my people. It’s the rare American who doesn’t have at least a drop or two of Irish blood, Judi. And, if you don’t, you are most welcome to join the tribe anyway! congratulations on your new release. Boston and Ireland are a winning combination. The secrets family's keep cause mayhem and despair, until a new generation realizes the secret doesn't affect them. So true, Margaret. Or maybe against today’s norms, the Big Secret is not such a big deal after all! I've heard "The only thing the Irish hold better than their tongues are their grudges." Of course, I live in "No Irish allowed" northern New England, so take that with a grain of salt. I write about (and live in) a small town, and my observation about our places is that the past may be buried, but it's never dead. After all, one of the great allures of moving to the big city - at least before you could search anyone's entire social history - was reinventing yourself. And isn't part of the story of America people reimagining themselves once they'd settled here? Of course, as BURIED TROUBLES points out, the one person who knows your secrets is the one you can't escape from. I live in a Massachusetts town that is 1/2 (at least it seems) Irish -- 3 Murphys within a 1-block radius, McDonough down the block, Kennedy around the corner... And we visited Ireland 2 years ago equipped with great advice fro our neighbors. Dipped our toe for a few hours in Northern Ireland. Yes, the past lives on, you feel it the moment you cross the border. Marian CONGRATULATIONS! on the new book! Cant wait to read it. Do you have any upcoming events? Oh, I can only imagine how overwhelming it must be to live in a deeply Irish-American enclave if it’s not your family background, Hallie! You are such an open, spirited person that I’m not surprised to know you found the positive side of it all and actually made a visit to the Old Sod. Ireland is changing, especially in the South where young people feel as much European as Irish. The North around Derry is still pretty tough - we can only hope that time will have a healing effect there as well. Launch of BURIED TROUBLES is next week, June 21 7 PM at th3 Concord Bookshop, 65 Main Street, Comcord MA. Thanks for asking! Growing up the child of an abusive alcoholic, our family learned very early never to speak about our dad's craziness outside the family. Heck, we barely spoke of it within the family, because of the anger it could trigger. I became very good at holding things tightly to the vest. Later, it was my mother whose behavior was a cause for staying silent, and to this day that is not recognized as having happened at all. Other family members, too, are in denial about shameful secrets from a long time ago. Later on, I think friends picked up on my discretion, and I've been the not necessarily willing ear to all kinds of their secrets. It's a big responsibility, don't you think? Yes, Karen, very hard and, again, requires enormous emotional energy that could be spent in other, happier ways. As for our family secrets around alcoholic parents or spouses or mental illness or whatever, Ann Mason said it well earlier in this thread - usually everybody already knows pretty much of this big secret anyway and we just don’t talk about it! 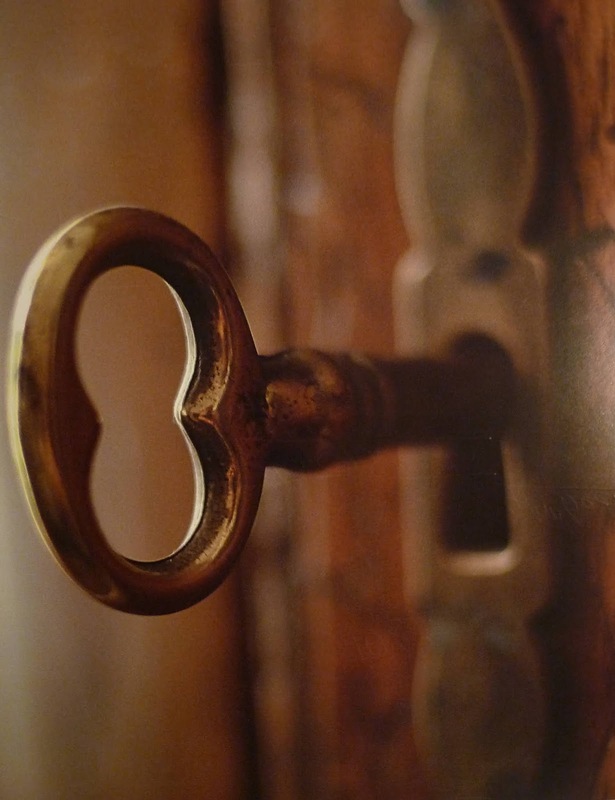 Thich Naht Hanh, the Buddhist monk, says that secrets become like knots in our brains--the longer we hold on to them and try to bury them, the tighter they become--the only way to get rid of them is to unravel the knot. Oh, my goodness, Flora - THAT’s a secret and a history that would make one wonderful thriller! I LOVE the quote from Thich Naht Hanh about secrets. Perfect imagery - thanks for sharing it. Hi Marian! Buried Troubles sounds intriguing. I just bought the Kindle version and am looking forward to reading it. Like so many Americans, I am of Irish descent and I love reading anything related to Ireland. Thank you, Cathy. As I’ve said, it’s the rare American who doesn’t have a drop or two of Irish blood. We Irish-Americans have, in many ways, a distinct culture from Ireland - but somehow, we still stay tied to that little island. I'm so excited to read this mystery. County Kerry felt like home to me even though my ancestors were mostly from Co. Mayo and Co. Donegal. When I came back to Alaska, I had rock retaining walls built in my backyard. Pity there's not enough room for a sheep. As for secrets: if I told, it wouldn't be a secret anymore, would it? Ha! Well, that would be true about telling your secrets, Keenan! Know what you mean about feeling at home in Kerry. 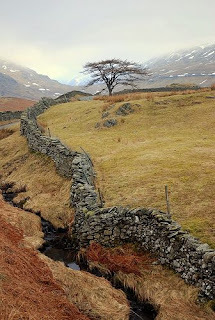 Just something about certain places where we may have had family links or similar to those areas - it’s almost physical. After you read BURIED, maybe we can compare notes on your Maeve and my Rosaria! I will be the oddball and say I am pro-secret. Some things in life are private to you and only you, and if that is your choice, I'd respect it--as long as it's your own secret. However, if your secret is chained up in the attic and you want to marry an innocent young girl, then you should tell your secret before someone does it for you at the church. Well, there is something to be said for that, Romana, which is why I try hard to keep secrets. (See my “deep as a well” reference”) Still, I do feel great relief when someone reveals a secret that everybody already knew anyway - “My mom has a drinking problem” or “I’m gay” or “Dave and I are having problems in our marriage”. Marian, I think of those as "open secrets" - what people know but no one has acknowledged formally. "Deep as a well" - yes. Best of luck with Buried Troubles. It's no secret it will be an enjoyable read. Marian, I'd like to know more about what drew you to this story, and if you have personal connections to Ireland? Thanks for asking, Debs, and thanks for hosting me! Ireland has a complex, often dramatic history which, to me, calls out for story-telling, The mix of the landscape, the struggle for freedom, all the secrets kept for fear of reprisal, the iron-fisted theocracy of the Catholic Church, and the spirit, humor and compassion that prevades the island all the same just attracts me. If you throw in the enormous wave of emigration to the US over the last century by Irish young people, who carry many of those memories with them, it’s rich ground for story-telling! I am a dual citizen of the US and Ireland. In my posting this week on the Wicked Cozy Authors blog, called All the Marys, I talked about some of that background as young Irish immigrants came to the old Charlestown neighborhood of Boston. Secrets should be kept hidden since divulging them means that innocents are hurt and become too interested in information they do not need. Every situation is different, just as there are many different kinds of secrets. I respect that. I am still unaware of secrets which were kept when I was growing up. I wish that I did know more now though. Your novel sounds captivating. And maybe your family was lucky enough in that it had no real Big Secrets! Thank you for your kind words. Yes, Celia - it’s a big responsibility to carry a secret for someone and a serious act of friendship. Sometimes, it’s a lot (too much?) to ask. I’m so happy you’ll be reading THE IMMACULATE. I think it’s a good read. I hope you feel the same! Welcome, Marian, and congratulations on your latest. I, too, write about Boston and always love to read stories set there. BURIED TROUBLES is going on my TBR pile! Did you have the chance to do some research in Ireland? I'm from Marblehead, MA and wondered which small MA town you call home? Thank you, Ingrid. I did do research in Ireland - very interesting. Mostly just poking around Connemara, which is stunning. Also, I’m a dual citizen of the US and Ireland, so I do have a reasonable familiarity. Love Marblehead. My small town is Concord. Great to meet you! Secrets always have a way of coming out. Whether in fiction or in real life. And yet we still try to keep them. I wonder why that is. Oh, so true, so true, Mark. Why we keep them? - heaven and a psychologist (Roberta, where are you?) know. Perhaps we are just fearful beings! I am ashamed to admit that as much time as I've spent in England and Scotland, I have never been to Ireland! I must remedy that. Any suggestions, Marian? Well, I’m a West of Ireland person myself, Debs. A drive along the Wild Atlantic Way from Donegal to the Dingle Peninsula is my kind of trip. Of course, you have to like mountains and the sea and . . . rocks. Lots of rocks! Couldn’t agree more, Marla. (“That’s IT? What’s the big deal?”) Of course, as time goes on, societal norms change. Some things we would just shrug at today would have been catastrophic for an individual or a family two or three generations ago. The book sounds wonderful, Marian! I'll have to check out your series. I'm actually thrilled to see people becoming more open about things they used to keep secret. I grew up in rural, conservative Missouri, where schools still debated holding a senior prom because many area churches felt dancing was a sin. Homosexuality wasn't spoken of, and young gay men were completely cast out of their families and communities. Gay women weren't recognized as existing. Against that background, I went into theater where many, many of my friends were gay. I was surrounded by smart, funny, creative, wonderful people, who pretzeled themselves in the most painful ways to deny who they really were and hide the truth from their families. They hurt themselves and their friends to cover a secret most folks in the wider world already knew and didn't really care about. To watch society move from that punitive attitude to the acceptance I now see makes my heart happy. Oh yes, we’ve moved forward in so many ways - gay identity being one of the major signs of movement. Good for you for joining the theatre - usually a sure way to spend time with creative, open and progressive people. My heart breaks to think of all the gay young people who have suffered for generations under our rigid constructs of what roles people should play in real life. Thanks for this thoughtful comment, Gigi. I agree with Ramona that some secrets should remain secrets, especially if the telling of them would cause anguish for innocent family members. There are/were secrets on my dad's side of the family. The odd thing is that some in the family (but not my dad) knew about the biggest one.He found out part of it between 45 and 50 years ago, and I remember that he was flabbergasted. He died when I was in my twenties. A couple of years ago I found out some of the rest of the story, and I'm glad my dad didn't live to hear it. Also interesting, is that some of his siblings heard the story growing up, and they apparently thought everyone else knew it, and just didn't want to talk about it. Similar to what others here have said about their own families, isn't it? Another testament to how complex our families can be, Deborah! Measuring the impact of sharing or not sharing a secret is so individual. Sometimes there doesn’t seem to be any right way to tell or not tell. We all just have to trust our best judgment. Hooray for your new book, Marian! I love family secrets interwoven with Irish history. Add the Troubles, and I now have BURIED TROUBLES on my TBR list! Congratulations! Thanks, Connie! Kind words from an author of her own fine works set in The Troubles. Endlessly complex with so many crimes, grievances and secrets . . . and stories. BURIED TROUBLES sounds delightful! I am just finishing another series that involved both Boston and Ireland, and would be thrilled to encounter another. In my family, the big secret was that my sister got pregnant about a year out of high school, in the late 1960's, and my father more or less forced her to give up the baby. I guess manipulated would be more accurate: he said he would pay all expenses to send her to a home for unwed mothers and give it up, or cut her off and she was on her own. And this was in the day where the first thing that happened was that she got fired from her job for being pregnant and unmarried, so she had no way to support herself. Fast forward 21 years and she had survived breast cancer and sought out the twin boys she had delivered. She has developed a relationship with them and we all know them now -- even went to one's wedding. She speaks openly about her kids and grandkids, and is much the happier for it. We all are. So that's my testimony to getting rid of secrets! Oh, that’s a tough one, Susan, but with a happy ending, My sister-in-law just hosted her son’s birth mother at her home with a family party. It was a lovely and joyous event. I am so glad we are in a much better place now. In BURIED, we touch on the travesty of the Mother and Baby homes in a Ireland, another sad and cruel way to deal with a teenager’s unplanned pregnancy. What could your sister have done? We gave these young women no choices. Not perfect now, but I’d like to think we’re getting better at these things! The Irish are fascinating (I'm part Irish). They tend to wear their hearts on their sleeves. Just listen to the music or the poetry! Yes, that would be true, Libby. Music and poetry are the heart of Ireland. Could do a lot worse as a national pastime! Love the Irish. So friendly! In our families it seems the earlier generations had secrets they kept. Family knew but they didn’t want the neighbors to know the scandals. Oh yes, Pat. Secrets in the kitchen, but God forbid the neighbors know. Of course, they always did anyway, but that’s another subject! Do secrets protect us, or do the bind us to fear of discovery? As I grow older I am more open. I now discover my 'horrible secrets turn out to be pretty boring in the light of day. another book to bring me closer to Boston. I must put this city on my places to visit in the near future. So true, so true, Coralee. When we bring our secrets into the sunlight after all those years - perhaps they aren’t such a big deal after all. Oh yes, I think you would enjoy Boston. Afternoon Update: After reading about the series early this morning, I just got off the phone from ordering both The Immaculate and Buried Troubles from my local B&N. Sadly, I still have to wait because they didn't have them in stock but soon I will have my hands on more good reading I'm sure. Marian, thanks! And I'm sure that I will enjoy the books. I don't know if they were out of stock or never got them in the first place though. This is a smaller store for the company and they don't always get everything, which leads me to have to special order books here and there. Oh my, this sounds like a wonderful series and latest book! I love reading about the Irish. Although I don't know of any Irish roots in my family, I am named after the Irish song, "I'll Take You Home Again, Kathleen. Thank you for stopping by the Jungle Reds, Marian. I'll be putting both books in this series on my Amazon wish list and my TBR list. Oh, I love that song - how sweet you were named after it, Kathy! I may be wrong, but I think the song was written by an Irishman in Chicago for his homesick wife. In my mind’s eye, I always hoped that - even if it was in their old age - that the man and his wife made it back, if for just a visit. Fantastic, Marian! I love a good family driven tale and all things Irish. I am so looking forward to reading your series. Thanks, Jenn - that’s very motivating for a writer to hear! I hope you enjoy the books. As I’ve said, that’s why I write!